A golden retriever poodle mix is a cross between a golden retriever and a poodle. They have been a mixed breed since the 1990's. The golden retriever's personality is devoted, playful and alert. They have high intelligence, like being outside but are indoor dogs who need family interaction. This mixed breed will vary in both size and color depending on the pup's parents. A poodle parent will either be a standard or miniature poodle. A golden poodle will be 21 to 24+ inches in height. A large standard is 20 to 24 inches tall and weighs 50 to 80 pounds. A medium standard is 17 to 20 inches in height and weighs 40 to 50 pounds while a miniature is up to 20 inches tall and weighs 15 to 35 pounds. They are active dogs who are usually good with other family pets. They need moderate amounts of activity each day including at least one walk. Goldendoodles live up to 15 years of age. Common health ailments include heart disease, eye problems, knee problems, hip problems, allergies and hypothyroidism. The golden's coat varies in color from light to darker gold. 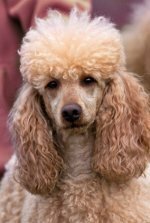 Poodle's have a variety of colors from black to silver to apricot to white. 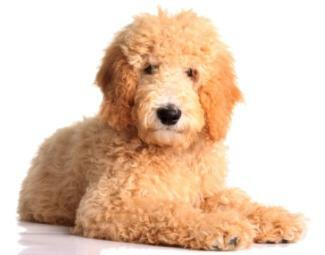 A goldendoodle dog's coat tends to be like the poodle's, and can be tight curls, loose curls or not curly at all. They can have a single coat, the curly coat or the golden retriever's short, medium or long coat. No or very little shedding plus less chance of allergies. Your poodle and golden retriever mix will be a loving addition to the family. Your family will have a faithful companion as the years pass by.